The best places to cross-country ski in this area are Ox Bow and Bonneyville Mill Parks where the trails are groomed. None of the Pumpkinvine Nature Trail is groomed. In addition, skiing on trails with an asphalt surface like the Pumpkinvine has the potential to damage the surface and the ski poles. 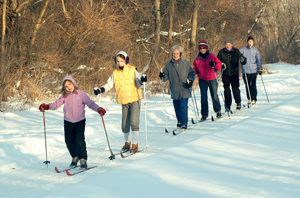 Consequently the only recommended place to cross-country ski on the Pumpkinvine Nature Trail is the limestone section of the trail from State Road 4 to County Road 28 north east of Goshen. You can rent cross-country skis at the Goshen Park Dept., 607 Plymouth Ave., Goshen. Phone: (574) 534-2901. Elkhart County Parks does not plow the parking lots at County Road 35 and County Road 37. Goshen Parks and Recreation The city plows the Pumpkinvine Nature Trail one plow-width wide from State Road 4 to the water plant on 5th St.
That leaves the other half of the trail open for cross-country skiing. The unplowed portion of the trail is not groomed for cross-country skiing. Plowing the trail is low priority. Parks The town plows half the width of the Pumpkimvine Nature Trail from York St. to the U.S. 20 tunnel. Now that the Ridge Run Trail is open, plowing the trail is a priority because it is a part of Safe Routes to School. From County Road 28 to County Road 33. However, this section may not be plowed due to drifting blowing and drifting snow. From County Road 35 to the north side of the U.S. 20 tunnel. From York Dr. to County Road 1150 W in LaGrange Co. The trail is not groomed for cross-country skiing. Plowing the trial is low priority. Shipshewana Shipshewana does not plow the trail from Couinty Road 850 W to 1150 W.